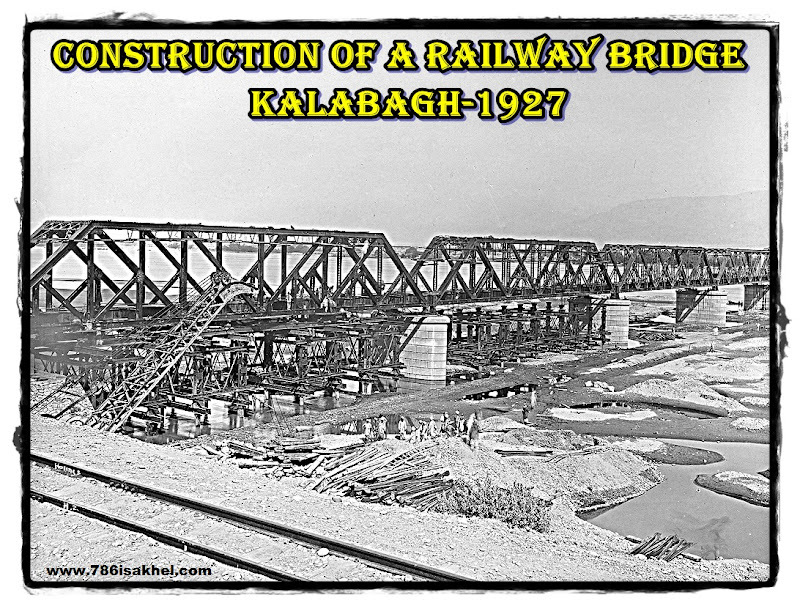 THE CONSTRUCTION OF BRIDGE OVER THE INDUS AT OR NEAR KALABAGH WAS CONSIDERED FOR MANY YEARS. SO THE FIRST SURVEYS WERE CARRIED OUT IN 1888 FOLLOWED BY INVESTIGATION FROM 1919 TO 1924. 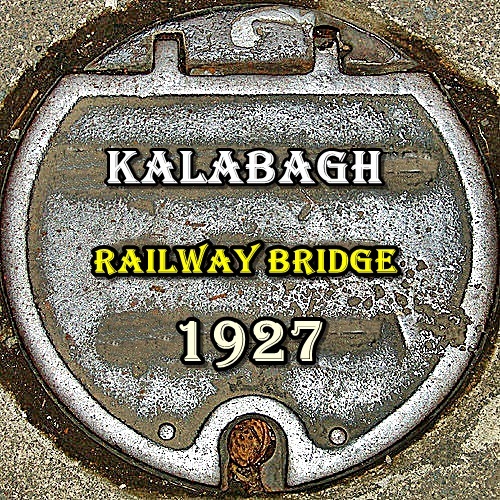 FINALLY IN 1927 THE PROJECT COSTING RS. 40.36 LAC WAS APPROVED FOR CONSTRUCTION. NO PROVISION FOR ROADWAY WAS MADE. 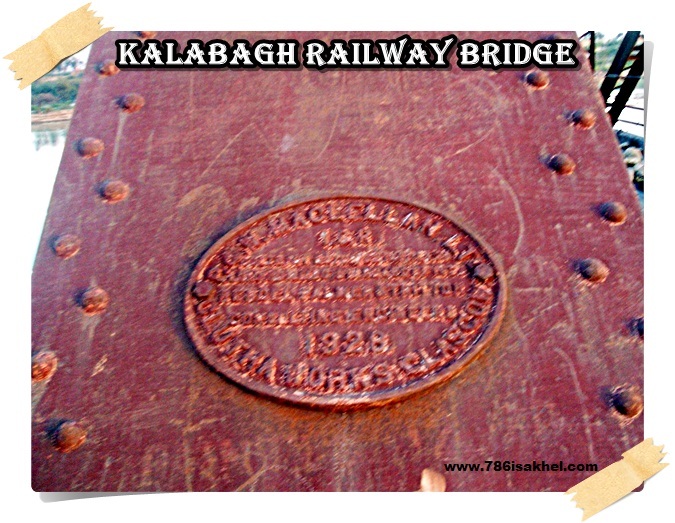 THE BRIDGE CARRIED A SINGLE LINE BROAD GAUGE RAILWAY. 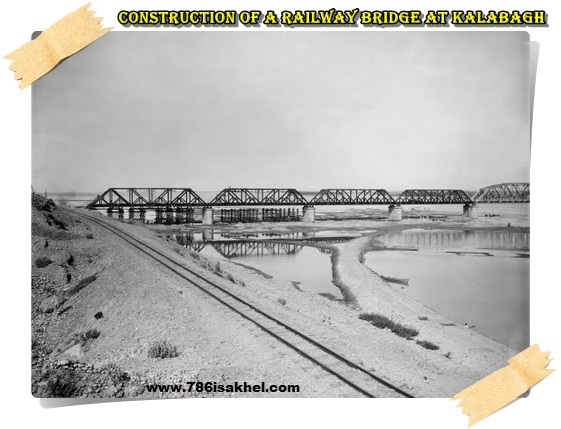 THE BRIDGE WILL CONNECT THE BROAD GAUGE (5-6″) SYSTEM OF THE RAILWAY ON EAST OF THE INDUS WITH NARROW GAUGE (2_6″) TO THE WEST. 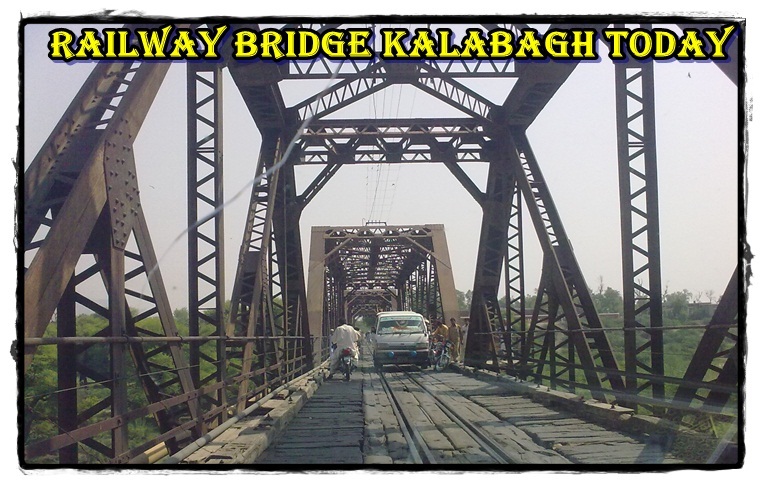 WITH THE COMPLETION OF THE BRIDGE AN ALTERNATIVE AND DIRECT ROUTE IS AVAILABLE FROM LAHORE TO WAZIRISTAN. COMMERCIALLY AND STRATEGICALLY THE BRIDGE WILL PLAY AN IMPORTANT ROLE. THE SITE OF THE BRIDGE IS ABOUT 1.25 MILES BELOW THE GORGE FROM WHICH THE INDUS EMERGES INTO THE PLAINS) THE COURSE OF THE RIVER AT THIS SITE IS STABLE. CHARACTER OF THE RIVER BED AT THIS SITE IS SUCH THAT FROM THE LEFT (MARI) BANK HALF THE WIDTH OF THE BED CONSISTS OF AN UPPERMOST LAYER OF FINE SAND COVERING A LAYER OF COARSER AND SHARPER SAND WITH SMALL PEBBLES. THE UPPERMOST LAYERS OF SAND DISAPPEAR AS THE DEEP WATER CHANNEL IS UN APPROACHED . BELOW THIS IS A COMPACT STRATUM AVERAGING 45″ THICK OF BOULDERS SET HARD IN SAND. THE BED OF THE DEEP WATER CHANNEL IN THE OTHER HALF OF THE RIVER CONSISTS OF LOOSE PEBBLES AND BOULDERS ABOVE THE COMPACT BOULDER BED. AN ALTERNATIVE PROPOSAL OF COMBINED WEIR FOR THAL CANAL HEAD WORKS AND RAILWAY BRIDGE WAS EARLIER REJECTED MAINLY BECAUSE THE SITE OF WEIR WOULD BE 4500′ LONG INSTEAD OF 2500′ AT THE ADOPTED SITE. THE PUNJAB IRRIGATION RECORDS SHOWED THAT AN EXTRAORDINARY HIGH FLOOD OCCURED IN THE YEAR 1878, WHICH WAS CALCULATED AS FROM 757,000 TO 770,000 CUSECS . 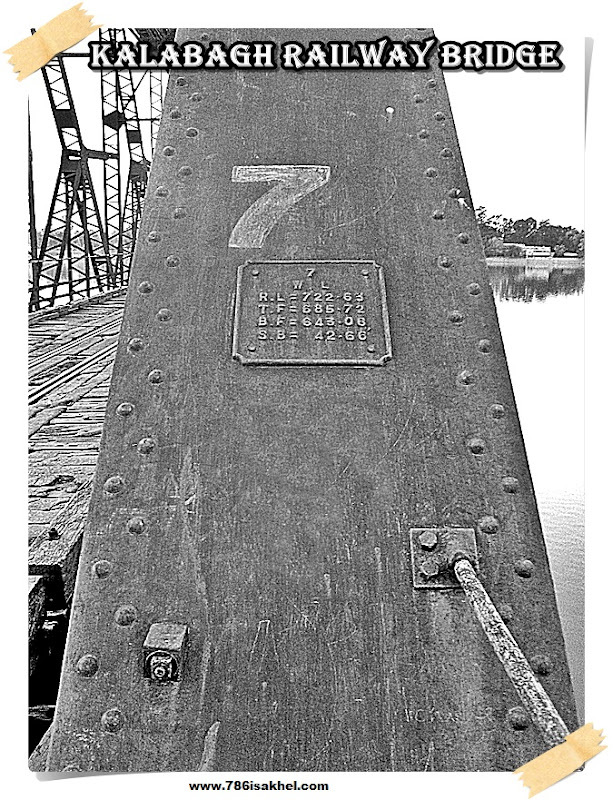 FOR THE DESIGN OF THE BRIDGE THE MAXIMUM FLOOD WAS TAKEN AS 8 LAC CUSECS. BUT THERE OCCURRED IN 1929 A FLOOD OF HIGHER MAGNITUDE DURING THE CURRENCY OF WORK AND THE HFL AT BRIDGE SITE ROSE TO 705.3′. IT. WAS ESTIMATED AS 12,00,000 CUSECS. THE DESIGN WAS CHANGED ACCORDINGLY, ADOPTING 12 LAC CUSECS AS PEAK FLOOD DISCHARGE. WATERWAY PROVIDED INITIALLY CONSISTED OF 9 SPANS OF 250′ CLEAR (263′ CENTRE TO CENTRE OF PIERS). 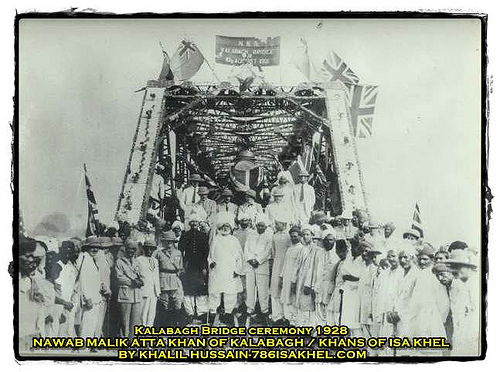 AFTER THE FLOOD OF 1929, IT WAS DECIDED THAT THE BRIDGE SHOULD BE EXTENDED TO COVER THE FULL WIDTH OF THE RIVER BETWEEN MARI AND KALABAGH BANKS. THIS ENTAILED AN EXTENSION OF THE BRIDGE AT THE MARI END BY 4 SPANS OF 175’_4″ C/C. GIRDERS OF STANDARD M.L. OF 1926 (FOR 22.5 TON AXLE LOADS AND A TRAIN OF 2.3 TONS PER FOOT RUN BEHIND THE ENGINE) ARE DESIGNED TO CARRY A SINGLE BROAD GAUGE LINE OF RAILWAY. THE LIVE LOAD IS CARRIED DIRECTLY ON AN OPEN FLOORING OF CROSS GIRDERS AND STRINGERS BY N TYPE TROUGH TRUSSES WITH CURVED TOP CHORDS AND EIGHT SUB-DIVIDED PANELS, THE MAXIMUM DEPTH OF TRUSS BEING 30-7.5″. THE LOAD IS TRANSMITTED TO THE PIERS THROUGH KNUCKLE BEARINGS. TEMPERATURE AND ELASTIC EXTENSION IS PROVIDED FOR BY ROLLER BEARINGS AT ONE END OF EACH SPAN, THERE BEING ONE PAIR OF FIXED AND ONE PAIR OF ROLLER BEARINGS ON EACH PIER. PIERS WERE INITIALLY DESIGNED TO BE MADE OF CONCRETE BLOCKS BUT LATER IT WAS INTENDED TO CONSTRUCT THEM OF MASS CONCRETE 1:2.5:5 TO AVOID HANDLING OF BLOCKS. . PIERS WILL REST ON 2 FEET THICK 1:2:4 REINFORCED CONCRETE BASE KEYED TO TOP OF WELLS. THE MAXIMUM INTENSITY OF PRESSURE AT THE BASE OF THE PIER IS 9.5 TONS PER SQUARE FOOT. CURBS TOOK THE FORM OF CAISSONS WHICH WOULD PERMIT ATTACHMENT OF AIR DOMES AND SHAFTS FOR PNEUMATIC WORK. INITIALLY TEN WELLS WERE PROPOSED TO BE SUNK. BUR AFTER THE ADDITION OF 4 SPAN , THREE MORE WELLS WERE ADDED. POSITION AT THE END OF WORKING SEASON 1928-29 WAS THAT SINKING OF 5 WELLS WAS COMPLETE. THE WELLS WERE PLUGGED, R.C PIER FOOTING AND 5 6″ OF PIER MASONARY BUILT. SINKING OF 4 MORE WELLS WAS IN PROGRESS WHEREAS WORK ON THE 10TH WELL WAS NOT COMMENCED. THE CHARACTERISTIC FEATURE OF THE SEASONS WORK WAS THE REALIZATION OF THE NECESSITY FOR PNEUMATIC SINKING. IT BECAME EVIDENT TO THE CONTRACTOR THAT OPEN DREDGING IN THE COMPACT BOULDER STRATUM GAVE VERY SLOW PROGRESS AND WAS IN FACT IMPOSSIBLE BELOW A CERTAIN LEVEL. THEREFORE BY MARCH, 1929 THE CONTRACTORS HAD OBTAINED A PNEUMATIC SINKING SET. PRECAUTION AGAINST SCOUR WAS TAKEN BY PROTECTING WELLS WITH PITCHING. THIS WAS NECESSITATED BY FLOOD OF 1929 WHICH HAD CAUSED TILTING OF WELLS. 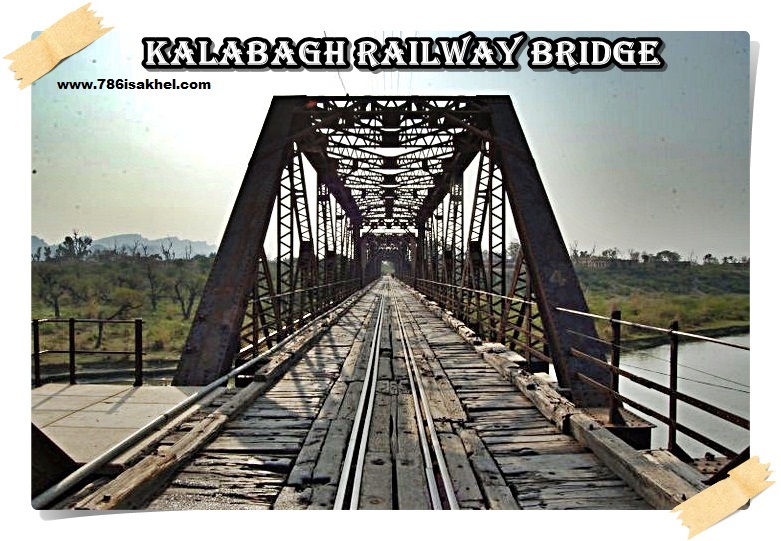 THE CENTURY-OLD KALABAGH RAILWAY BRIDGE OVER RIVER INDUS HAS BEEN CLOSED TO TRAFFIC OWING TO ITS DILAPIDATED CONDITION AND FREQUENT FATAL ACCIDENTS OCCURRING THERE.THE BRIDGE WAS ACTUALLY CONSTRUCTED TO CONNECT TANK AND BANNU TOWNS OF THE NWFP TO PUNJAB THROUGH A NARROW-GAUGE RAIL TRACK. 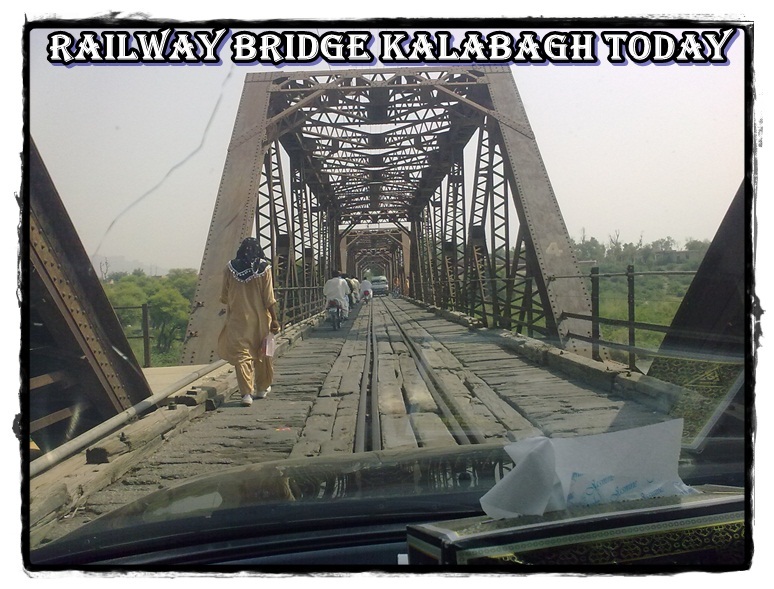 THE RAIL SERVICE WAS CLOSED OVER A DECADE BACK AND THE BRIDGE WAS BEING USED FOR VEHICULAR TRAFFIC. 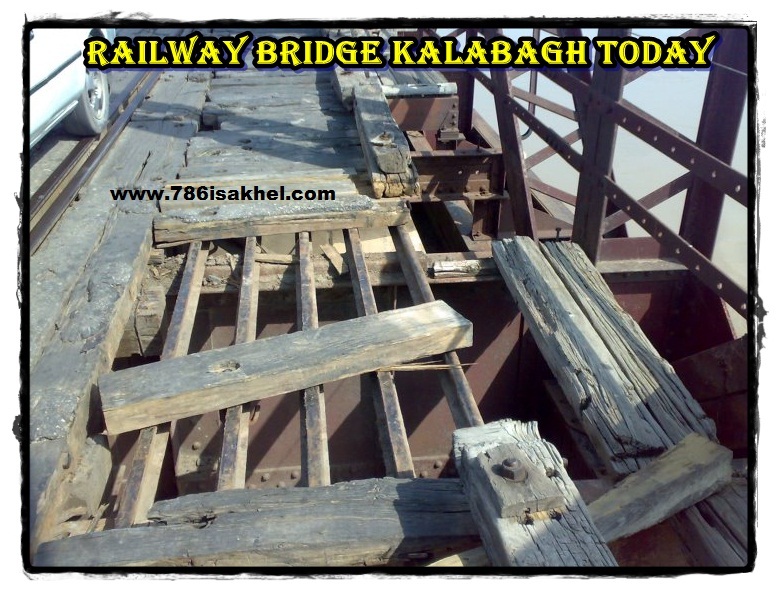 HOWEVER, LACK OF MAINTENANCE HAD TURNED THE BRIDGE INTO A VIRTUAL DEATH TRAP FOR THOSE WHO HAD NO OTHER MEANS TO CROSS THE RIVER TO REACH MARI-INDUS OR ISKANDARABAD. 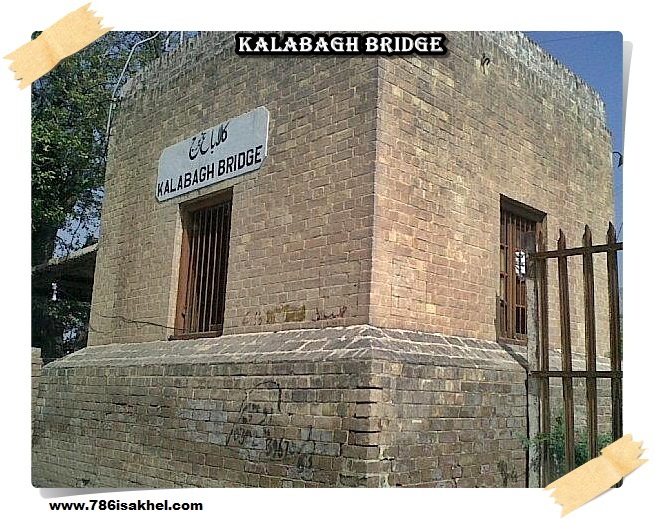 THE DAILY COMMUTERS CROSSING THE BRIDGE MOSTLY INCLUDED RESIDENTS OF KALABAGH TOWN EMPLOYED IN FACTORIES AT ISKANDARABAD, AND THE STUDENTS WHO HAD TO REACH THEIR SCHOOLS AND COLLEGES ACROSS THE INDUS. 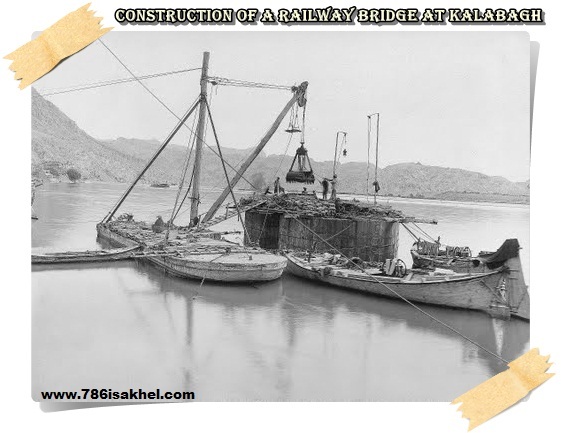 BEFORE THE CLOSURE, THESE DAILY COMMUTERS HAD TO TRAVEL SEVEN OR EIGHT KILOMETERS TO REACH THEIR RESPECTIVE DESTINATIONS ACROSS THE INDUS, BUT NOW THEY WOULD HAVE TO COVER ABOUT 20 KILOMETERS BY CROSSING THE RIVER USING JINNAH BARRAGE BRIDGE. 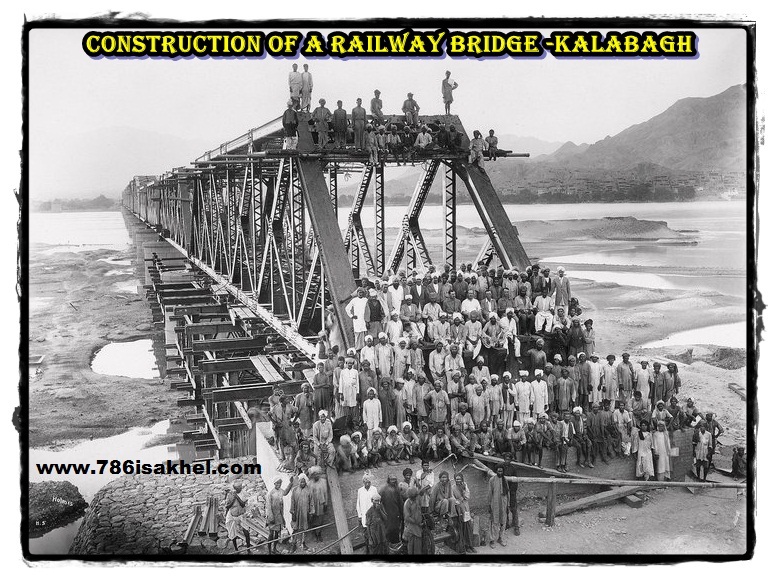 THE DILAPIDATED BRIDGE HAD BEEN CAUSING FREQUENT ACCIDENTS WHEREIN PEOPLE WOULD FALL IN THE INDUS BECAUSE OF THE BROKEN WOODEN SLEEPERS. ACCORDING TO REPORTS, FOUR PEOPLE FELL FROM THE BRIDGE AND LOST THEIR LIVES DURING THE LAST THREE MONTHS APART FROM OTHER ACCIDENTS. LOCAL POLITICIANS PLEDGE REPAIRS OF THE BRIDGE DURING THEIR ELECTION CAMPAIGNS BUT NOTHING CONCRETE HAS SO FAR BEEN DONE IN THIS REGARD. EVEN A PROMISE MADE BY PRIME MINISTER YOUSUF RAZA GILANI DURING HIS RECENT VISIT TO THE AREA COULD NOT MATERIALISE. DISTRICT COUNCIL MEMBER HAJI SIKANDAR TOLD THIS SCRIBE THAT EVEN THE FREQUENT FATAL ACCIDENTS HAPPENING ON THE BRIDGE HAD FAILED TO MOVE THE HIGH-UPS. 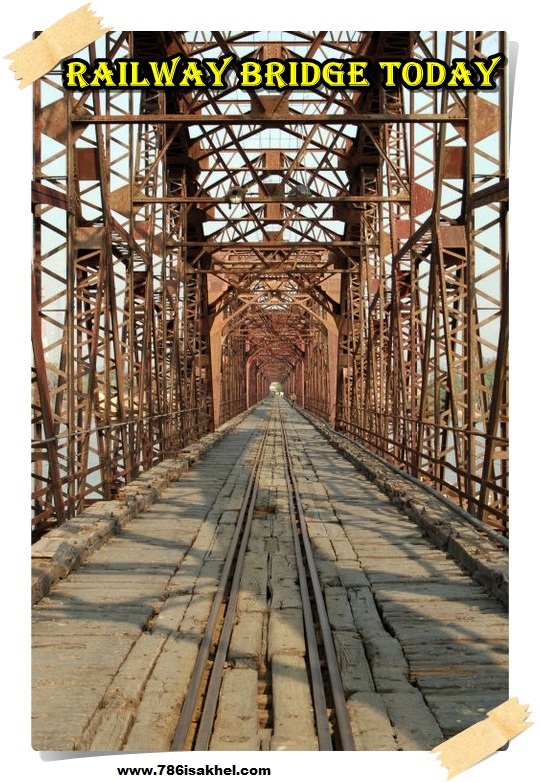 ANOTHER REASON FOR THE OFFICIAL NEGLECT REGARDING THE BRIDGE IS THAT NEITHER THE PAKISTAN RAILWAY NOR THE PROVINCIAL HIGHWAYS DEPARTMENT TAKES FULL RESPONSIBILITY FOR ITS REPAIRS.